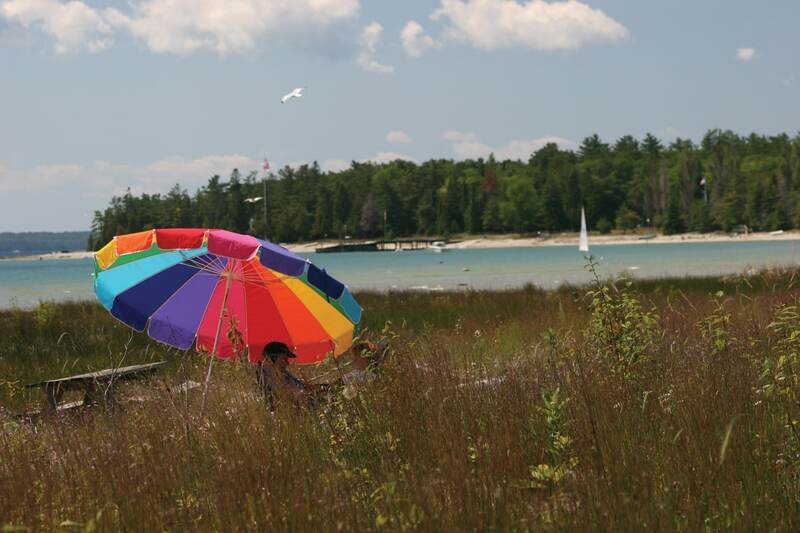 Northern Michigan islands are beckoning from the blue. Slip away for a breezy, fresh-seas adventure. We all know, of course, that an island is a place where the lake bottom rises up to pierce the water’s surface, just a hill surrounded by liquid. Great Lakes islands can be piles of clay, gravel and sand, or bulbs of cooled lava, or slabs of limestone—which, after all, is simply compacted shells from dead sea animals. There’s little romance in any of that. Still, we heap romantic notions upon our islands. We say islands float, a flat denial that they are even connected to this world. They are dream clouds, lands upon which we project our visions of the ideal escape, or even an ideal life. (If I were marooned on a deserted island I would … ) The fact that we can point to islands, actually see them floating there, makes such fantasies seem plausible. So does the fact that so many Great Lakes islands are within easy reach. We map out six Great Lakes island vacations for you and show you how simple it is to get there and to stay for days, weeks, maybe longer. 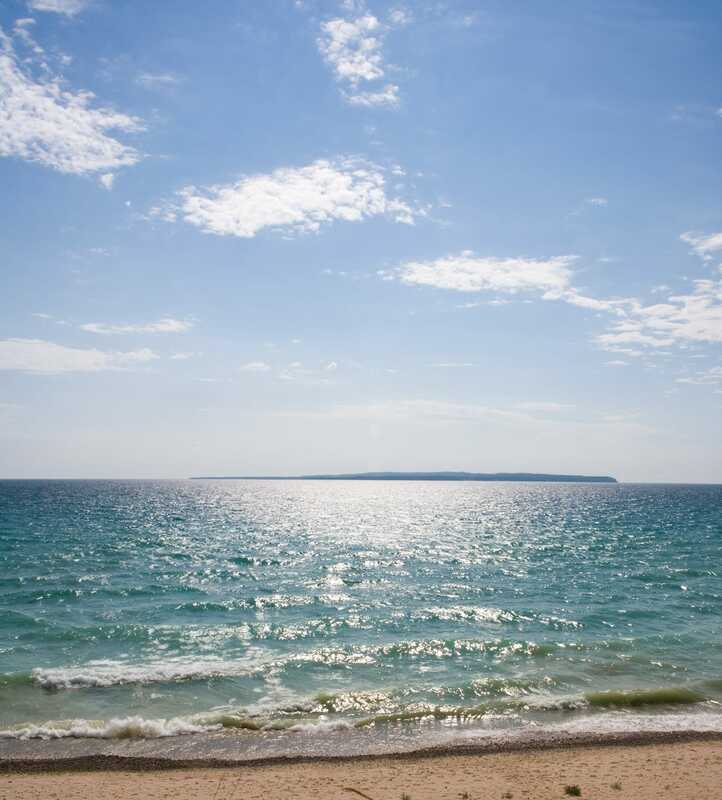 Explore wilderness solitude on North Manitou Island, time travel in the Victorian grace of Mackinac Island, or rejuvenate your soul amid the island quiet and easy ways of Bois Blanc Island. And there’s more. 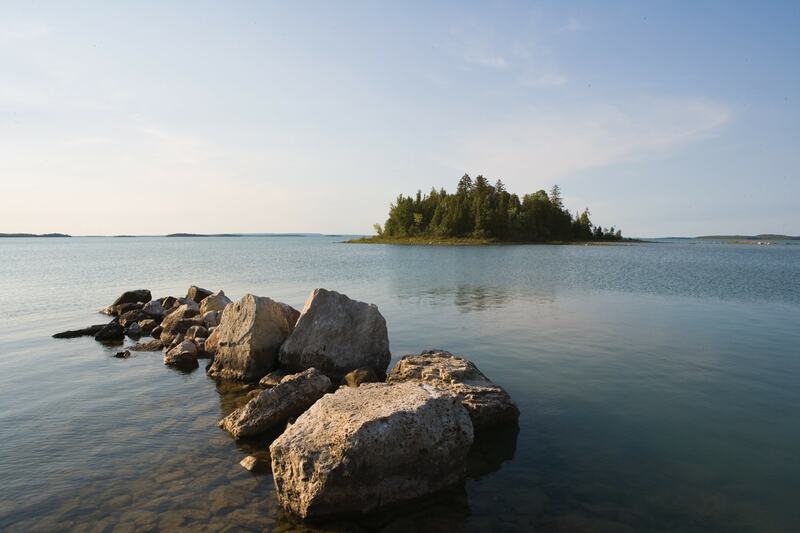 So long as your backseat reverberates with an “Are we there yet?” refrain, Drummond Island deserves a top notch on your list of family vacation destinations. In one fell swoop, a 10-minute ferry ride across the St. Mary’s River answers your antsy interrogators and brings the fam to an Up North island where rest and ruddy-cheeked recreation—think bikes, boats and beaches—rule. Drummond, aka the Gem of the Huron, is a 136-square-mile hunk of rock, prairie meadows, cedar swamps and hardwood forests. The key to appreciating the value of this gem’s varied landscape? Use every mode of transport available. Bike along the island’s eastern shore from Glen Cove to Marble Head or Shale Beach. Then kayak the western shore—Potagannissing Bay is nice for novice paddlers; stronger paddlers can push on toward the cluster of tiny offshore islands. Drive the roads that cut through the Maxton Plains, a hot and dry spread of alvar grasslands that looks like an African savannah. Off-road at Turtle Ridge ORV Park. Or book a custom island boat tour or go fishing with Island Charters. Prefer to keep your feet on the ground? Walk the township park’s Heritage Trail—the 3-mile trail is a favorite haunt of eagles, ospreys, owls, hawks and 200 kinds of songbirds. Likewise, hike the 80-acre Williams Nature Preserve with an easy 1.3-mile trail. Or simply kick around the shallows at Big Shoal Beach, sink your toes into the sandy beach and inform the kids: you are here, and here you’ll stay. Lodging: Bunk up at The Lodge at Drummond Island Resort and Conference Center and you’ll have free access to bikes and kayaks. It also boasts a lot of on-site perks families will love—tennis, volleyball, heated pool, Scandinavian sauna and more. What do you do on a 3.5-square-mile island where the downtown is two streets deep and cars were banned when they were still called horseless carriages? You do what folks have done here for more than a hundred years: relax. 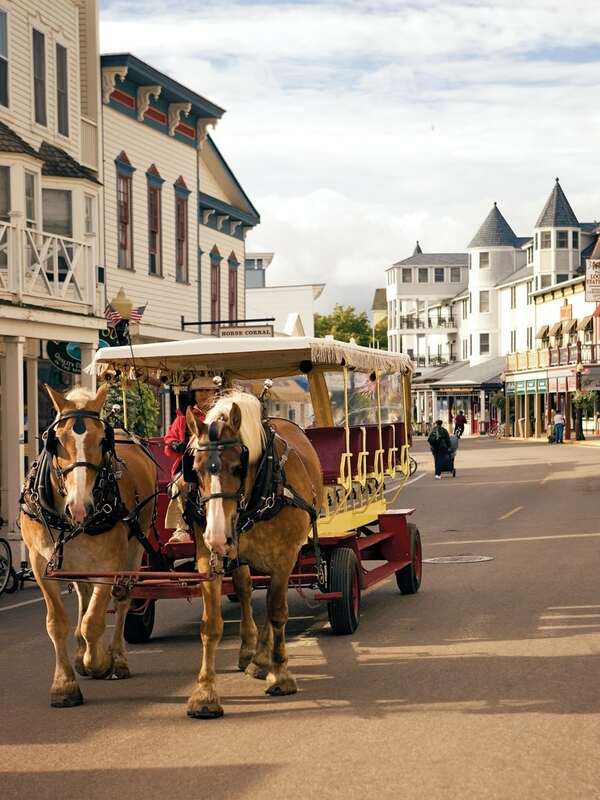 Board a carriage for a trot around the white-picket-fence Victorian neighborhoods where views of Lake Huron’s lacy waves peek out from behind gables and turrets. Rent a bicycle built for two to make the 8-mile pedal around the island even more romantic. Gather a stash of flat stones, and see how many times you can make them skip. Take a seat in a rocker on the Grand Hotel’s 660-foot-long white porch and rock. Ride a horse through a woods of birch, spruce, beech and maple. Put your hands over your ears while the cannon is fired at Fort Mackinac, then mosey over to the bluff-top deck of the fort’s tea room and sip maybe the best milkshake you’ve ever had in your life while you watch the ferries and sailboats come and go from the harbor below. Eat the island’s famous fudge while it’s so fresh it’s still warm. Finally, go to sleep to the clip-clop of horses hooves and the purl of breaking waves. Wake up to the same. You know you’re in the Upper Peninsula when your private island comes with a pontoon boat—and a Jon-boat, canoe and rowboat. 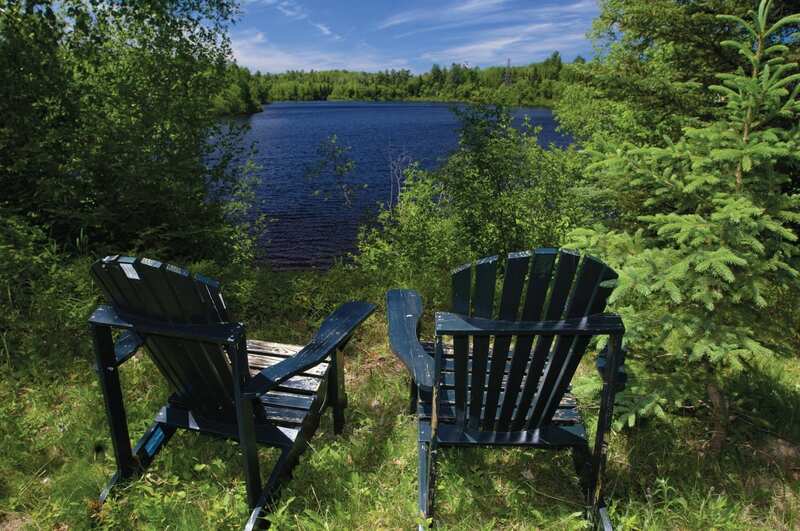 Republic Island is a classic Yooper camp smack dab (well, sort of) in the Michigamme River near the sleepy former mining town of Republic, about 35 miles west of Marquette. The unpretentious facilities include a three-bedroom cedar log cabin with a modern kitchen and small bathroom. Outside there’s a patio with charcoal and gas grills. But out here, what’s beyond the cabin (sand beach and awesome fishing) is way more important than what’s at the cabin. In short: buildings humble; setting remarkable. The Michigamme River’s smooth dark waters roll by on three sides, and a low-lying floodplain that teems with birdlife connects the little lump of high ground to the wooded riverbank. Yes, technically this is not an island—but this far north things in general are less precise. And an island solitude still prevails, because state forest blankets the banks, and few other cottages stand near. Park along the paved road paralleling the river, load your gear and pets (dogs welcome) into the pontoon boat and shove off for the island a short hop across the current. Amenities? Sure, there’s a TV and Wifi, but the sunset on the river is calling your name. Later on, the scent and crackle from the cobblestone fireplace will beckon. Rates vary by season and range. View availability and prices. Chances are slim that you will ever see one. But have no doubt, they are there. And moreover, they know exactly where you are. Perhaps they have seen you. To be sure, they have caught your scent. Yours is not a smell they like. No one has ever been harmed by a wolf on Isle Royale. But knowing the wolves roam there—grey ghosts back among the trees—shapes your sense of island space. 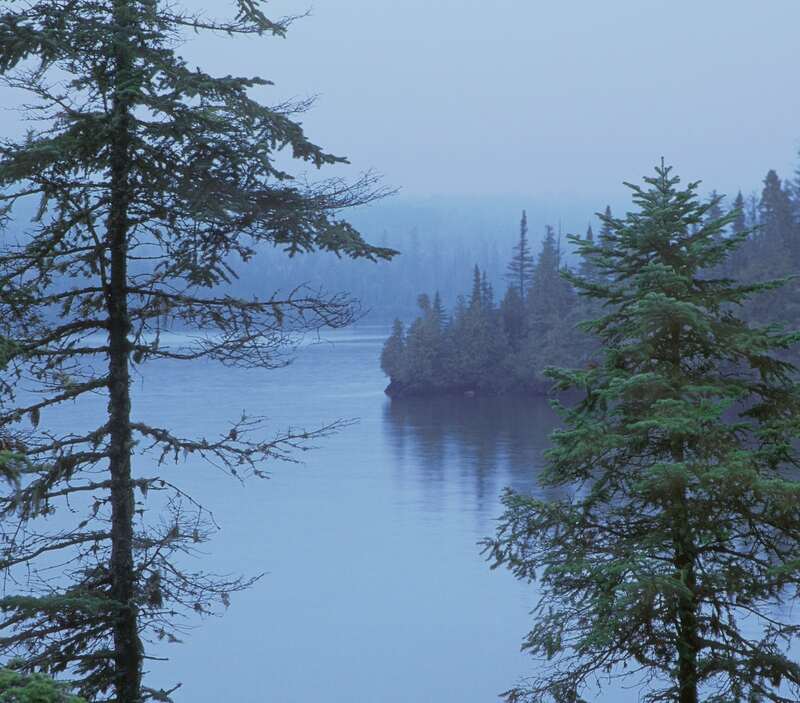 They are what makes Isle Royale a true wilderness and not some outsized city park. Here, man is no longer at the top of the food chain. Isle Royale National Park is a 45-mile-long slash of evergreens and rock 53 miles north of Copper Harbor. The park also embraces some 200 adjacent islands, all of which make for wonderful kayaking, especially around Five Finger Bay, on the island’s northeastern fringe. Casual hikers love the easy Stoll Trail that starts at Rock Harbor (the main dockage), passes ancient Indian copper mine sites and then ends with dramatic views of Lake Superior from Scoville Point. For experienced hikers, the Rock Harbor shoreline trail passes 19th-century copper mines and, with an extension, can end up at Chippewa Harbor, one of the prettiest coves on the island. For those with sinewy thighs and a sense of mission, try Greenstone Ridge trail, which runs along the high backbone of the island to the outpost of Windigo at the island’s southwest end. Along the way, plan on a camera-full of wildlife. Moose (their numbers are up to 1,600 as of April 2017 due to the low wolf population) regularly wander through campsites. Also expect otters, 150 different species of birds—including the eerily joyful loons—snowshoe hares and bushy tailed foxes that seem to have no more fear of humans than farm dogs do. Just don’t expect to see a wolf. Best time to visit: Anytime is good, but come in early June and September for fewer people and fewer bugs. For details on the ferry to the island, park fees, hiking, camping, paddling and fishing, and an information packet, visit www.nps.gov/isro or contact Isle Royale National Park at 906-482-0984. If you like the deep woods, clear-as-gin water (and don’t mind a little dust) make a Straits of Mackinac voyage to the wilds of Bois Blanc Island. The island’s Plaunt family has offered ferry service to and from Cheboygan since 1932. Plaunt Transportation has room for a few vehicles each trip, reservations required. Nicknamed Boblo, this 12-by-6-mile outpost runs deep with mystique. Trappers used to stop here and get cleaned up before going to Mackinac Island. The impassible swampland of the north shore still hides brown crockery left by 1920’s rumrunners. During the early 1960’s University of Michigan archaeologists dug up a meadow to find a summer village from 1,000 years ago—complete with skeletons, pottery, arrowheads, harpoons and fish bones. Today’s islanders have mastered deconstructed living—electricity only just came here in 1967—with simple cottages, one B&B, two restaurants, pristine forest and dusty dirt roads. Slipping into island time means you pace your day without a clock, just by the erratic and haunting foghorn. And simple things get new glory. Hushpuppies and a cold beer—good always—taste like heaven in the middle of Lake Huron. The Bob-Lo Tavern (3 miles east of the ferry docks) serves them up with fantastic shrimp scampi dinners. Skip stones at three in the morning, swim at Snow Beach, then go on wildflower hunts (gloriously, half the island is state forest, with white and Norway pines reaching 100 feet tall and more). Don’t miss the robust island square dances and the fresh-baked cakes at Hawk’s Landing. And before you leave, comb the beach for stones that make out the letters: lucky. Lodging: Retreat to Insel Haus Bed & Breakfast, perched on a meadow with panoramic views of the Straits. Innkeepers Shelby and Christa Newhouse filled their Old World retreat with antique leaded glass, pocket doors, gorgeous chandeliers, deep pantries and lots of quiet nooks. Berlin-born Christa spoils you with feasts of scrambled eggs, bagels, lox, sliced provolone and turkey, yogurt, fresh cranberry-orange bread with butter and her favorite Polish plum jam. Old Orchard Lodge also has two rooms available for rent. Each room can sleep up to four guests. Thigh deep in water, surrounded by twilight, I’m standing with my 14-year-old son on the western shore of North Manitou Island casting lures into a calm Great Lake. The sun set a bit ago, and now we have the mile-long Crescent Beach to ourselves. The few other backpackers who had drifted down to catch the sunset left when the orb slid below the rim. On a scale of one to ten, the likelihood of our catching a fish hovers around 1.5, but I don’t care. I’m happy to linger in island silence and watch slicks of gold, peach and magenta shimmer on blue-black water. A gibbous moon rises over our shoulders. The damp air of coming night carries mingled scents of lake and forest our way. An hour later we reel in and walk the half-mile to our camp in the forest. No headlamps required in the orange-gray shadows of the summer moon. Typically, such peak moments happen only occasionally, spaced sporadically throughout the year. But in the four days we camp on North Manitou, they arrive in a steady stream. The brisk boat ride over on the deep blue waters of Lake Michigan in late summer. The hike along 7 miles of deserted beach on our second day. The discovery of beach spiders so well camouflaged they looked like button-clumps of sand skittering over the shore. Manitou means Great Spirit, and indeed my spirit feels great here. North Manitou lies just west of Leland and is part of the Sleeping Bear Dunes National Lakeshore. The island embraces about 23 square miles of classic Northern Michigan terrain: 400-foot-high dunes on the northwest corner, flat beaches on the southeast corner, and in between, forests of can’t-get-your-arms-around-them hemlock, beech, maple and oak. One extra-special treat is the shimmery Lake Manitou—an easy wade loaded with huge and hungry smallmouth bass. More than 20 miles of gentle trail, plus 20 miles of beach. Still scouting? 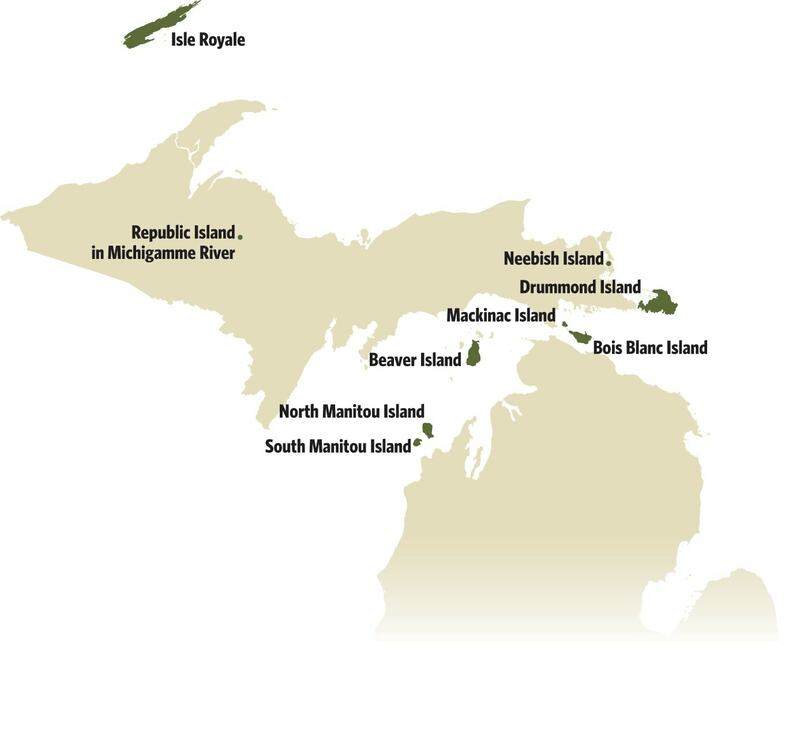 Here are thee more Northern Michigan islands to explore. 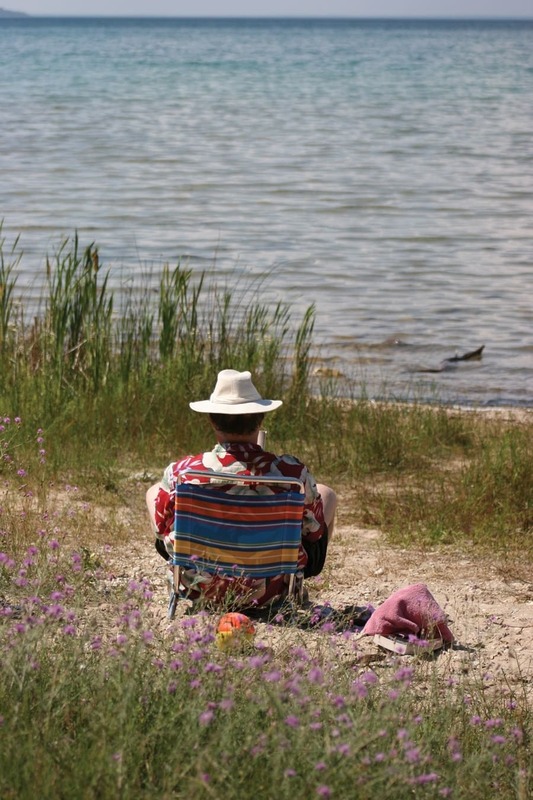 Daytrip or extended camp on this 8-square-mile island in the Sleeping Bear Dunes National Lakeshore. Access by ferry (Manitou Island Transit) from Leland. A 55-square-mile island with a mix of public and private land. Small town, rich history. Access by ferry or plane in Charlevoix. A 21.5-square mile island—4 square miles public—in the St. Mary’s River. Access by ferry from near Barbeau. This Traverse Magazine classic was published in June 2007. Subscribe for more Up North moments delivered to your home every month.